Dr. James R. Soles addresses the graduates at Winter Commencement 2007, when he received the University's Medal of Distinction. 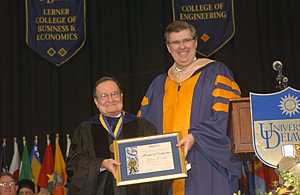 Howard Cosgrove, right, chairman of UD's Board of Trustees, presents the University of Delaware Medal of Distinction to James R. Soles at Winter Commencement, Jan. 6, 2007. Editor's note: Click here to see a video clip of Dr. Soles with New Jersey Gov. Chris Christie, when Christie was inducted into UD's Alumni Wall of Fame on June 7, 2010. Video courtesy of Ralph Begleiter, UD Center for Political Communication. 2:49 p.m., Oct. 29, 2010----James R. Soles, a long-time member of the University of Delaware political science faculty and a highly regarded expert on politics, particularly Delaware politics, died Oct. 29 at Christiana Hospital. He was 75. Dr. Soles, who was Alumni Distinguished Professor Emeritus, joined the Department of Political Science and International Relations in 1968 and taught courses specializing in American government and public law until he retired in 2002. Twice a recipient of the University of Delaware's Excellence in Teaching Award and a winner of the University's Excellence in Advising Award, he was named the University's first Alumni Distinguished Professor, created to recognize outstanding teaching and mentoring. Shortly before he retired from UD in 2002, many of his former students and colleagues created and contributed to the James R. Soles Citizenship Endowment. UD President Patrick T. Harker said, “Jim was nothing less than a legend at the University of Delaware and across the state. He advised a lot of legislators over the years, and made them better policymakers and better politicians. But Jim's real legacy is that he made thousands of students better citizens. How beloved he was among his students is a testament to his greatness as an educator, a mentor and a person. James J. Magee, professor of political science and international relations, said, “No faculty member I have known has ever had a greater influence on the academic and personal lives and careers of so many UD members. Through personal charm and genuine concern, Jim was an inspiration to scores of faculty and, especially, his countless students and advisees. Many aimless or uncertain undergraduates, and some graduate students, who might not have ever even finished their education he counseled and successfully convinced to stay the course, redeploy their talents and finish their degrees to become successful men and women in every walk of life. He had a special concern and ability to reach troubled or wayward students. For some students, he was literally UD's St. Jude. “Thousands of UD students in his courses inspired with a combination of his matchless imaginative pedagogy, boundless knowledge of politics, and understanding of the complexity of human nature itself. He respected people and humanity too much to judge its inevitable shortcomings. He amused students and everyone with whom he spoke through magnificent wit and humorous stories embellished with his down home, Southern style. He could be tough as nails and the most kind and understanding fellow colleague or teacher anywhere,” Magee said. “Through his own exceptional lifelong commitment to public affairs, he motivated and even opened doors for talented young people to enter public service. His abiding professional legacy is not in published journals but on display, for decades, in the presence of distinguished federal and state judges, governors, national and state legislators, mayors, diplomats, public defenders, district attorneys, private attorneys and a multitude of other public servants and ordinary but civic-minded Americans who keep the Republic working in the service of society. His unique and profound impact can never be overstated and is unlikely ever to be duplicated,” Magee said. Joseph Pika, who is the James R. Soles Professor of Political Science and International Relations, said, “For thousands of UD alumni, Jim Soles will remain 'their most unforgettable teacher.' He made politics both real and uplifting -- never retreating from the unpleasant truths of American politics but making it clear what great things politics could accomplish. He inspired scores of students to become engaged by helping candidates, running for office themselves or simply by paying greater attention to their role as citizens. “Jim's lectures were legendary, a unique blend of Southern storytelling, evangelistic fervor and life lessons,” Pika said. “His skills made even the largest class held in a Smith lecture hall seem like a conversation. He was even more powerful one-on-one, and he single-handedly turned lives around, combining a genuine concern for students' problems with a tough love of high expectations. He had a special appreciation for 'rogues' and underachievers who turned their lives around, and he helped many do so. He could be disarmingly charming or one of the toughest SOBs you could imagine, and he relished both roles equally. Dan Rich, University Professor of Public Policy and former UD provost, said, “For nearly four decades, Jim Soles set the high bar for teaching and mentoring at the University of Delaware. In recognition of these remarkable contributions, he was the clear choice to become the University of Delaware's first Alumni Distinguished Professor. His stature on campus was matched by an extraordinary range and depth of contributions and influence beyond campus. He was a public scholar, who formed a bridge between the community of ideas and the community of action. Generations of students journeyed with him across that bridge to make their mark in every important domain of human activity, and most especially in the politics and governance of Delaware and the nation." Among his many awards and honors, he received the Liberty Bell Award from the Delaware State Bar Association and the Del Tufo Award for Distinguished Service to the Humanities from the Delaware Humanities Forum. He was named a Danforth Associate, selected as an American Council on Education Fellow and chosen as a Salzburg Seminar Fellow, and he also served as chairperson of the Department of Political Science and International Relations. For several years, he performed a one-man show across the country, portraying James Madison reminiscing about the Constitution and the Bill of Rights. Dr. Soles was the co-author of The Government of Delaware and co-producer of the WCAU-TV series Delaware: The First State. He also wrote about constitutional law and politics, Delaware government and higher education. His wife of more than 50 years, Ada Leigh Soles, died June 7, 2010. A former academic adviser at UD, she was a respected civic leader and legislator, and she was awarded UD's Medal of Distinction in 1996. A memorial service is planned for 10:30 a.m., Wednesday, Nov. 3, at St. James Episcopal Church, 2106 St. James Church Rd., Wilmington. Memorial contributions may be made to the James R. Soles Citizenship Endowment, in care of the University of Delaware Development Office, 011 Hullihen Hall, Newark, DE 19716, or the Food Bank of Delaware, 14 Garfield Way, Newark, DE 19713. Online condolences may be left at the Strano and Feeley Family Funeral Home website.